Are you ready to make your sewing plans? In the last couple installments, we talked about choosing silhouettes for our new mini wardrobes and defining a color palette. With those two things in mind, along with all the work we’ve done before on defining our style and prints that we like, it’s time to decide what pieces we need to create a coherent little wardrobe. I’m going to outline the steps I went through. See if they make sense for you too. Before diving into all your dreams for the brand new wardrobe you’re going to sew, take some time to see what you already have that fits. Again, here are my silhouettes. I’m also including variations on some of these silhouettes: the shorts could be swapped out with a mini skirt, and the slim pants with a slim pencil skirt. After going through my drawers and closet, I found that I had several items that are in my chosen palette and fit into these silhouettes. Here are some things I found (items are similar, not exactly the same). Once you know what you have to work with, figure out what you need to complete your silhouettes. This is a good time to decide how big you want your wardrobe to be. If you don’t have most of what you need in your closet already, are you comfortable with buying or making a lot of new stuff? If not, it’s best to keep your wardrobe very small for now and build from there in the future. If you anticipate having lots of sewing time and a big fabric stash to shop from, go to town! For me, I found that I needed strappy dresses, strappy tops and tanks, and sundresses. This was the fun part for me. I looked around for inspiration that fit within my palette and came up with tons of ideas. If you want to get really precise and technical, you could list out exactly how many of each type of piece you need and assign colors to each based on your palette. For me, I found that a more organic approach worked better. Finally, list out the pieces you need to make or acquire. Here are mine. You can do yours as an inspiration board like this (I used polyvore), sketch, or just make a list. Ok, so here are my lists. 1 simple full skirted dress in black and ivory window pane plaid. Yeah. I know it’s a lot. But most of these are really quick and easy to sew, and some of them I already have fabric for or have begun working on, so it’s not as much as it looks. I do need one new pair of flat sandals, because I completely trashed my last pair in Mexico City last October and had to throw them away before getting home. Similarly, I need new sneakers for my more active days (as much as I’d like to, I can’t ride a bike in clogs). I always seem to need new sandals and sneakers every summer. Try following the steps above to come up with your list of projects. I really enjoyed using polyvore for this, but you could use any tool you like: Pinterest, a sketchpad for ideas, a physical scrapbook or moodboard, a written list, whatever! Next week, we’re going to be adding in more accessories since those are important too. After that, I’m going to have a very special free download to help you plan individual sewing projects. Fun times! I’d love to know what you come up with from this! Do you find that you need to make a lot, or just a little? Are there things you’d rather buy than make? How’s it all coming together for you? A kimono wrap is definitely ob my list too. Light and airy just enough to keep the chill away in the evenings. I think I may make more than one though. I would be interested to know which pattern you would use or design for yourself! I might use that and just make it short, but it seems so simple to draft yourself. It’ll depend on how lazy I feel! I’m so glad you did this wardrobe architect series. It came along at the perfect time, because my workplace changed our dress code to business casual. After wearing a uniform for fourteen years, I find myself suddenly needing a work wardrobe! I definitely need to make a lot, across several seasons- a couple of skirts, a few pairs of lightweight pants, knit tops, light sweaters, and some woven tops too. I hope I’m up to the challenge, but with guidance from wardrobe architect, I think I can fill the holes with things I’ll wear constantly. Your inspiration board is beautiful and I love that you have included items you already own in your plan. A wardrobe will always be a work in progress. I’ve put a lot of thought into all this and you’re architect series has been very helpful (thank you). Actually it has helped me realize that I don’t like to plan too much. The work I’ve done has been in assessing my needs and I now approach my wardrobe as something that needs structure, balance and harmony. But I only want to actually plan the individual garments one at time. Every time I finish sewing something, I try it on with other garments, see how it’s all working and then plan the next piece. It’s actually been working out quite well for me that way. So far, I’ve made several garments for my spring wardrobe which all are quite consistent I think. Hi Sarai, thank you for sharing all this wonderful advice, it’s very inspirational. I have a query – I work part time, would you suggesting creating a small collection of clothes for work and a slightly larger one for home, or would you create one larger collection that will suit both? I would ideally love to make most items I need, however, I don’t really have enough time, so will have to settle for making a few and buying the rest. I hope to make a few Sorbetto tops and am just about to complete my first Laurel dress! I think it depends on how much overlap there is in the clothes you wear for work and non-work. I wear basically the same types of clothing all the time unless I need specialized clothing (like working out, hiking, gardening). If you’re more comfortable wearing dressier clothes for work than for home, I’d create a sub-wardrobe for work. I feel like I have mini wardrobes for those special activities. I have a small selection of workout clothes for example, a selection of loungewear, etc. I think this would be a good future post! The timing of this perfectly coincides with spring cleaning!! Can’t wait to dig into my closet and dresser and figure out what holes I have in my wardrobe. I feel surprised of my colour palette choices – I’ve realised that I had to adapt some of them for a more fresh Spring/Summer vibe. Although I love saturated red and mustard yellow they are Autumn/Winter colours for me, hence the coral red and acid yellow popping in instead. And sky blue, gotta have that! So far I would like to sew an Archer shirt in acid yellow/lime green, a drapey silk jersey dress in navy, shorts in sky blue, update the coral red blazer I inherited form my mum and there is a Macaroon to be sewn as well :) Might have to buy in the skinny jeans I need. And I already know what shoes I am buying! Pinterest board for ideas, wish list and work in progress is linked below. Onde again, thank you so much for organising this, it has been the highlight of my week for the last couple of months and also has driven me to start my blog. Oh I can already tell this part is going to be the most fun! Although I won’t get to it for a couple weeks, I can’t wait to get started. As everyone else mentioned, I have really loved this series. I plan on revisiting it at the start of each season to plan and organize. My only problem now is that my closet is stuffed to the brim and yet I still just want to sew sew sew! Looks like I need to do some editing first! You’ll feel so good when you do! I did my wardrobe clean out this weekend and got rid of SO much stuff. I feel free to sew more now. I am realizing that I have several pieces already in place, but I recognize that I need to make several things. BUT, they were already identified as needs and fabric is obtained in most cases and ready to begin sewing. Sleeveless Laurel — needs to be hemmed — it’s a TV watching project now. 1 pair of shorts — already fitted. Oodles of Renfrews — already fitted, fabric washed and ready to cut out. Mostly white, navy, red, red/navy/white stripes. Lightweight cardigans — I don’t have time to knit them, and I’m unsure exactly what I want pattern wise. I need button up the front shirts, but that doesn’t have to be ready to wear this spring/summer, but definitely by fall. I’m going to spend the summer working on adjusting the pattern. 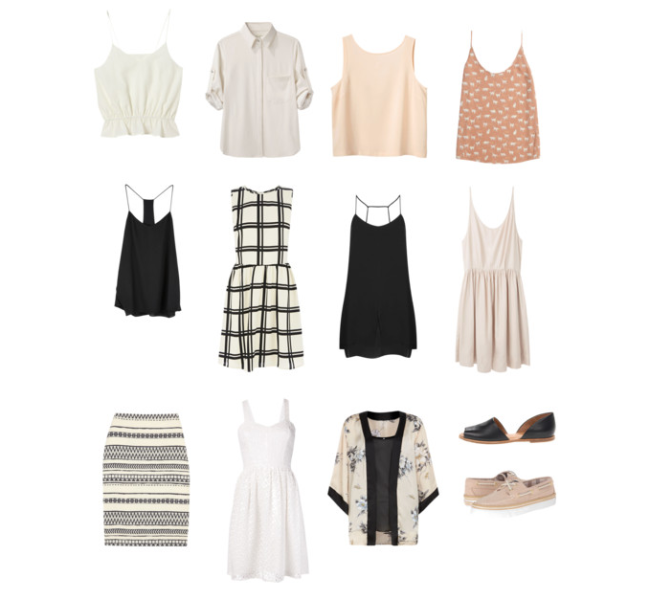 I really do love the idea of also basing the capsule wardrobe off of things you already have, too. I have to make a lot, mostly because I am 52 and prime time for difficult weight fluctuations. I have gained 20 pounds over just 2 months, which is about 2 sizes. Fortunately I have a huge fabric stash, and now that spring is here and prime gardening time, not so much spare time, but since I have few clothes in my new, and hopefully temporary size, and I don’t want to buy much at all, I MUST SEW! Weight changes like this make capsule dressing a useful concept. As to buying, I read a Tim Gunn book on style, and really identified with his assessment that you’re either a Cleopatra or a Helen – you prefer tailoring or drape. Being a Cleo, I snapped up a tailored shirt on super sale. It’s a nice cotton with a little stretch, and a white abstract dot pattern on black and is quite fetching. Having made many tailored shirts for me and my husband, I know how much work and how time consuming they are to make myself, so that’s my solution – buy for now until I get back to my preferred size. Shoes! Last weekend I bought 6 pair, all good quality, in styles I can really use, and again, on super sale. I am sure it is an emotional reaction to gaining weight, but I spree shop like that perhaps once a year, so I am going to be kind to myself this time. Forgot to mention, the kimono is a great choice. I own several vintage kimonos ( mostly men’s short kimono – I forget the name for them) and they are wonderful to wear, and always made of superb silk or cotton. I also have a few patterns and need to make more. They are a very versatile choice, and very fast to make. Fantastic series, thank you for these inspiring posts! did i miss how we decide many items would work for us? I know Into Mind (started following since you have discussed it on here – it’s a great blog so thank you!) has methods based on the number of days you want to go before repeating an outfit. i have things in my palette in all my silhouettes but not enough to only/ mainly wear them! I am somewhat in delay with all this, but am committed and reeeally enjoying this series of yours. 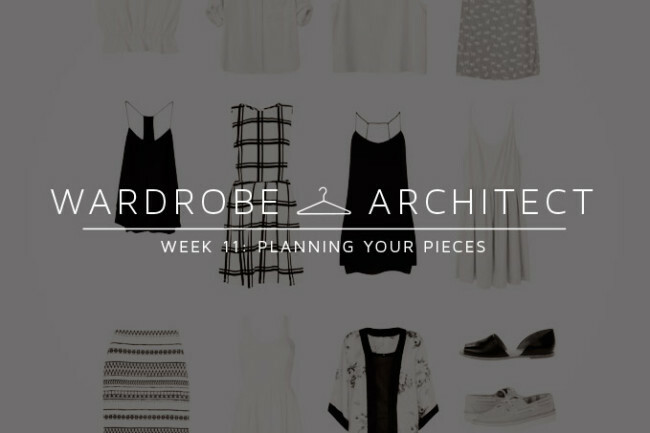 An “architecture” of my wardrobe I was already trying to do, but it is SO helpful having a guide! I am working on it for a few months already, and until now I was only eliminating, not able to structure my future, so to say. I am a great admirer of you work, and I am really grateful for this idea and for you sharing your knowledge and personal investigations. Really, it’s been so helpful, you can’t imagine! I am still on week 3, just wanted to express my URRAYs! What a great series. With spring finally here, I’m going to have to take a serious look at my wardrobe. Since I have a very small closet (includes all clothing) I have always had to be quite conscious of all the items in my closet, but only over the last few years gotten better at coordinating. With your thoughts and suggestions I will now take a new look and see what can be improved. I’m more sure of what looks good on me than maybe 10 years ago and also my tastes have slightly changed. Hopefully I can combine all of your lessons into ONE?? We’ll see as I get started this weekend. Thanks!! Thank you for this series, it’s been very interesting getting my head around all the elements required to construct a wardrobe rather than a collection of garments. My starting point for putting together a wardrobe is buying shoes. Because I take a size 12, my options are somewhat limited. So I buy shoes I like and need, then work my wardrobe out from there, as it is easier to coordinate clothes to shoes, than the other way around. Does anyone else out there work from the ground up, literally? My problem is that most of the fabric shops where I live are quilting shops and don’t have many choices apparel fabrics. I also don’t have a lot of confidence in just whipping something up. I always feel like I need a pattern and a plan. The worst thing for me is spending the time and money and then hating it. …and have actually already drafted & sewn a few garments and bought some others, as well as ordering yarn to knit a few sweaters and a cardigan after realizing I don’t own a single cardigan, that I actually wear. Shocking right? Thank you so much for enlightening me with your series and giving me a structure to work from! Once I cleaned out my closet it was like a light came on in my head. All the Wardrobe Architect exercises dots were connected. I now see the holes, I know what I want to make and my plans are taking shape. Wonderful series. Thank you! Because I’m a giant dork, I actually took a census of my closet. I wrote down everything in it, including colors and types of items. Then I looked at the numbers and things immediately jumped out at me: one-third of my items are black, one-sixth of my entire wardrobe is the same type of top, I only own one thing in this color I love, etc. There were things I thought I had enough of that I actually only have a few of, and other things I thought I needed more of when I actually have plenty. So if you’re like me, and you know you’re not satisfied with your wardrobe but you’re rifling through it and thinking “I dunno, it all looks OK to me,” try doing a census. Numbers don’t lie! ha ha, that’s funny… perhaps I should do that! I should do that again. I did it about eight years ago… and found somewhat to my horror that I had almost 50 items that could be described as “a black top”! Of course they weren’t all equivalent (shortsleeved T-shirt versus longsleeved velvet evening top versus cotton button-down shirt) but it was a good reality check. At the moment I feel my wardrobe has a split personality: lots of print dresses, but also a lot of boyish shirts and jeans. I think I need both sides to be happy, but there isn’t a lot of crossover between them, which makes it hard to form a capsule collection. I’ve been following along with the series loosely but not completely tasks, just mulling things over in my head. But tonight I decided to sit down and go back over them all so that I would have a solid plan before getting into any new sewing projects. I’m surprised how much it actually helped to joint down my notes from each week. It all came in so handy for this final exercise; when I’d written a list of things to buy/make but I needed to assign a colour I was so relieved to choose them from my small list I’d chosen earlier! I have a fair bit to make; I have many of the items I need but am not 100% happy with them. So I’ll be starting with the thing I’m really missing then replacing the others until I 100% love my wardrobe. I’m going to make: a jumper (we’re heading into winter! ), trousers (probably juniper), a pinafore style dress, an off-white plain button up collared shirt, 2 aline skirts, a flowy pleated skirt, refashion a blazer I have, and another blouse or two. I just went shopping today with the whole wardrobe architect series swirling through my head. I now have five, well-made, great-fitting, versatile pieces that not only look great together, but match everything in my closet. I totally owe this to you. I tried on way more pieces than I normally would before getting grumpy and buying something “good enough” to make me feel better. I didn’t buy anything just because it was onsale. And in the interest of my personal style – the shorts that fit me perfectly? I bought in two colors. So thank you. I’ll be thanking you all summer long. Finally posting about my choices for spring. Pretty excited about them. I’m hoping to tackle even more but I don’t like to plan more than is practical for me to accomplish. Any extras will just be pleasant surprises! I also want to ditch a bunch of things I’ve been keeping “just in case” I need them.